Have You Checked Your Liquid Application Systems this Winter? calving interval. Trace mineral nutrition affects uterine involution and resumption of ovarian activity, which are imperative to a cow returning to estrus and cycling after calving. Hormone regulation and production are also significantly affected by trace mineral nutrition and status. After calving, a cow begins a regular estrous cycle starting with hypothalamus function. The hypothalamus produces gonadotropic-releasing hormone (GnRH), which requires calcium (Ca) and copper (Cu) to stimulate release. GnRH then causes the anterior pituitary gland to produce follicle-stimulating hormone (FSH) which stimulates the development and maturation of a follicle, and luteinizing hormone (LH) which causes ovulation of a follicle to occur. Ca, Cu and zinc (Zn) are crucial for FSH and LH production. Once a follicle is selected and ovulates, a corpus luteum (CL) forms on the ovary. Manganese (Mn) and magnesium (Mg) stimulate the CL to produce progesterone allowing pregnancy to be sustained if the egg has been fertilized. With so many intricate pathways in the reproductive cycle of a cow, it is crucial to provide all essential nutrients in the highest quality, and most absorbable form. Since trace minerals are essential for the production and regulation of hormones, providing them at the right times and in highest quality form is imperative. Beef cows should be supplemented with either MAAC® or MINTREX® trace minerals, two high quality, complete minerals, beginning 60 days before the first cow calves and continuing through breeding season. Novus® provides trace mineral solutions proven to optimize reproductive performance in beef cattle. Let’s Geaux with Novus® to NCBA in New Orleans in 2019! We are excited to join cattlemen and women at this annual event and work together to develop new nutritional and management strategies to better the beef industry. Stop by our booth #325 to discuss our approach for optimizing beef cattle nutrition! What is your previous training? Before I came to Novus®, I worked for the University of Wisconsin-Extension as a regional Dairy & Livestock Specialist. I worked with local farmers and developed programming in areas relevant to their current and future needs. I received my doctorate and master degrees from the University of Minnesota in dairy cattle welfare in three housing types and transition cow management and behavior, which tied in nicely to the Novus® C.O.W.S.® program. My dedication to the dairy industry arose from growing up on a small dairy farm and working for neighboring dairy farmers. In your role what is the most interesting thing you do? Right now, I’m being pulled in a lot of different directions, and it keeps things interesting! Other Novus® world areas are interested in having their own C.O.W.S.® program and will need training to keep our services consistent throughout the world. At the same time, we are working on moving our data from over 1300 US and Canada C.O.W.S.® assessments into a new database, while simultaneously working to streamline our on-farm data collection. We anticipate reduced turnaround time and improved customer satisfaction as a result of these efforts. I’m working with people from non-farm backgrounds who are designing creative solutions for data housing and user interfaces as well as with coworkers in other parts of the world in order to ensure our format for C.O.W.S.® will meet their customer needs. There is never a boring moment. What is your favorite Novus® product? My favorite product is MINTREX® D. My cattle and horses are on it, and I have seen improvement in my horses’ hooves from being on the product. I like having methionine, minerals, biotin, and selenium all wrapped in one package. 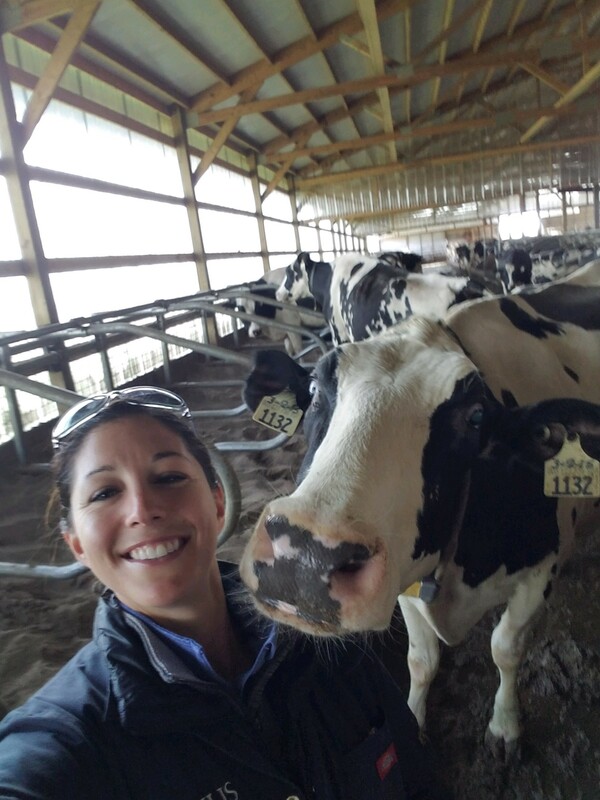 A dairy producer informed me of the improvements brought forth from a C.O.W.S.® assessment, which made me feel like I was really able to make a difference. I try to listen and ask questions to clarify the problem and work from there. It may require pulling in others or taking a step back to look at the big picture. When you are not promoting Novus® products and formulating rations, what do you like to do? I like to do anything that has me moving. Running with my dog Dante and horseback riding with friends are two of my favorite things to do. My husband and I now have some of our beef cattle on our property and have spent a lot of our weekends this past summer putting up fencing and prepping for a shed that we plan to build soon. If you had to choose only one book for your library, what would it be? The book I go back to is on horse training, Downunder Horsemanship by Clinton Anderson. I’ve incorporated these lessons while working and handling cattle. It’s all about pressure, release and maybe more importantly, the timing of applying or releasing pressure to get the animal to learn what you want it to do. The latest certificates showing that MINTREX® is OMRI approved in the US and Canada are available. Please contact your local Novus® sales representative or Customer Service to obtain a copy.